For our first ever attempt at an international collabrewation we thought it would be logical to start small and stick to something mildly predictable and familiar. That idea was quickly ditched when we met Rolim from Mean Sardine and the idea of a wine infused saison was tabled. Mean Sardine is one of Portugal’s leading craft breweries and have twice been voted as the country’s number one craft producer. Originally put in touch by Al, a good friend of both the breweries and the owner of the iconic Great Northern Hotel in Carlton. We soon realised the opportunity to produce a beer with such a good group of people was something we couldn’t turn down. With Mean Sardines passion for brewing Saisons infused with lighter wine styles, we thought what a perfect time to work with a style they’re familiar with but also try something a little left of centre and incorporate Australia’s rich reputation for big and bold red wine. Finding a local wine producer that would be kind enough to supply us with the volume of wine (in trade for beer of course) wasn’t as easy as first thought. Luckily for us we were able to call on a friend from Stefani Estate in the Yarra Valley, who were very kindly able to supply us with a delicious and bold 14% Shiraz. After a vigorous and hot fermentation, followed by a lengthy conditioning phase in the fermenter, the beer was put into a limited amount of kegs and carefully hand filled into 750ml champagne bottles. Bottles will be available by the end of the month. 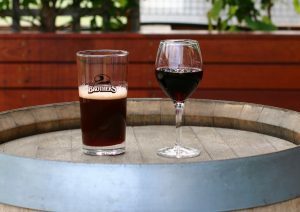 If you want to ensure one is held for you at the BeerHall, please send an email to beer@2brothers.com.au . If you do happen to pick one up by all means drink crisp and fresh, but don’t be afraid to cellar in a cool dark place and enjoy it down the track like you would a nice red wine!